The sacred staircase Scala Santa is said to be connected to one of the most important submissions in the New Testament, with Christians far and wide flocking to Italy to see it for themselves 300 years after it was originally discovered. The find was originally covered up with wooden planks by the Vatican and has been left that way for centuries to protect its 28 steps which thousands of years ago saw people crawl up them on their hands and knees to beg for forgiveness for their sins. It was believed Jesus had climbed the steps where at the very top he was sentenced to death by crucifixion by Pontius Pilate. As so many people had climbed the steps, erosion caused the staircase’s partial deduction to just 15 steps, prompting the Vatican to protect it. 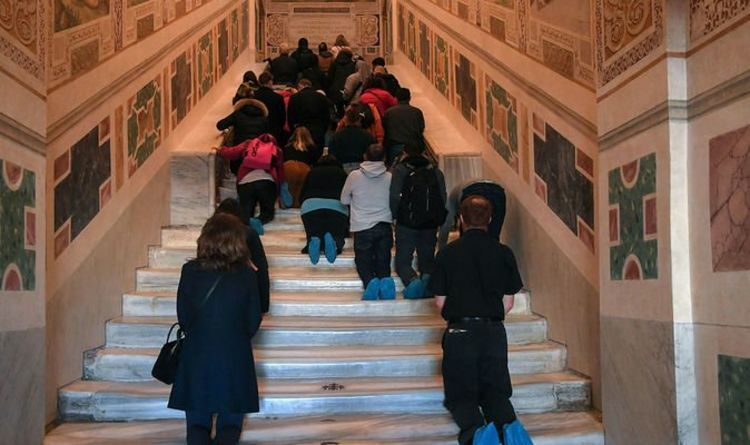 Now, experts from the Vatican Museums removed the planks and cleaned the marble underneath. Perhaps even more fascinating is that Mr Violini’s team found three ancient bronze red-stone crosses when the wooden planks were removed. Legend has it, these crosses mark the exact spots where Jesus’s blood was spilled. The relic is open for 60 days over the Easter holidays and throughout the rest of spring. On June 9 it will be concealed again. The crucifixion of Jesus Christ is believed to have occurred between 30-33 AD. According to the gospels, he was arrested before being sentenced to death sentenced by Pontius Pilate who ordered him to be nailed to a cross by the Romans. He was hung between two convicted thieves and died six hours later, according to the Gospel of Mark. Gospels add that his body was put in a tomb because it was forbidden that the dead be left out at night. Up to three days later, the door of the tomb was open, they claim, and and angel told them Jesus had risen. This period is celebrated as Easter by Christians.